Flying in the face of mainstream medicine and society’s many health myths – here is a book that finally proves that good health is by far the most valuable possession you can ever have. More than that: Radiant health is not only easily achievable – no matter where you are right now – it’s your natural state. Compiled over the course of 30 years in the health industry – and by working directly with thousands of people across the globe – Timeless Secrets of Health and Rejuvenation reveals everything you need to know in order to unleash the natural healing power that lies dormant within you. 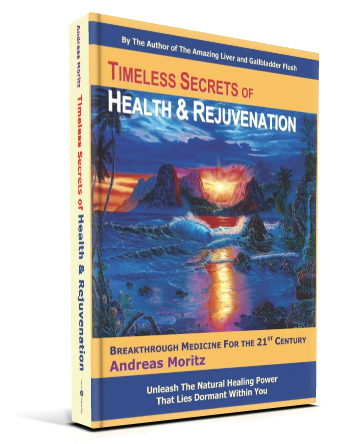 By Andreas Moritz These “Timeless Secrets” Free You From Medicine’s Most Dangerous Myths. It’s Time to Finally Reclaim the Youthfulness, Vitality and Abundant Health You Deserve Flying in the face of mainstream medicine and society’s many health myths – here is a book that finally proves that good health is by far the most valuable possession you can ever have. More than that: Radiant health is not only easily achievable – no matter where you are right now – it’s your natural state. Compiled over the course of 30 years in the health industry – and by working directly with thousands of people across the globe – Timeless Secrets of Health and Rejuvenation reveals everything you need to know in order to unleash the natural healing power that lies dormant within you. You may wonder, “How could one book possibly do all this?” After all, many books make big health promises and then fail to deliver. But the answer is simple: Timeless Secrets is different – and works – because (1) it gives you deeper insights and perspectives that literally put you back “into the driver’s seat” of your body and mind… and (2) it reveals literally hundreds and hundreds of controversial, yet highly practical secrets proven to trigger health, wellness and accelerated healing. You’ll Get Little-Known, Ancient Secrets – Successfully Used for Thousands of Years … … Plus, you’ll discover newer ones that have been researched and documented by some of the leading authorities in the world, both mainstream and alternative … and most importantly, you’ll discover the very secrets which have worked – time and time again – for the countless people Andreas Mortitz has helped heal in his 30+ years of front-line experience. No matter what your current level of health and wellness, the scores of brand new tips … breakthroughs … “aha!” moments … practices … and discoveries you make while reading Timeless Secrets of Health and Rejuvenation are sure to help you quickly reclaim life’s happiest, most valuable possession: Your health. The best part: You’ll get it all in plain English, with step-by-step, “do-this-then-do-that” instructions – so there’s never an ounce of guesswork – thereby empowering you to live with more youthfulness, balance and joy, from the very first moment you open the book. So why not put Timeless Secrets to the test? It may prove to be the most comprehensive, life-changing health guide you ever read. Product Details Paperback: 546 pages Language: English ISBN-10: 097927575X ISBN-13: 978-0979275753 Product Dimensions: 11 x 8.2 x 1.2 inches Shipping Weight: 2.8 pounds Here’s a taste of what you’ll discover in the chapters: Chapter 1: Solving the Mind/Body Mystery – And the Magic That Occurs When You Do How a simple meal can help you solve the mysterious relationship between your mind, body and spirit. Hint: Most foods will do, as long as you prepare them the way described on page 7. Startling Scientific Heresy: Why new research is showing that you don’t just think with your brain-you “think” with every cell in your body. Use this secret to become a far more connected, balanced person. Pages 8-10 The simple test which tells you-with stunning accuracy-which foods, herbs, beauty products or remedies will help you … and which ones will hurt you. Page 9 The #1 health danger caused by stress – and the three-part solution that relieves your excess tension and uplifts your mood. Pages 9-10 The three – and only three-ways to heal your body. Page 11 40,000 Times Stronger Than Heroin: Pages 11 shows you a secret way to use the “placebo effect” to relieve pain and improve virtually any aspect of your health. What big drug companies don’t tell you: Why your body can manufacture its own “drugs” at will-especially when you understand how it happens. Page 13 The rare instances when a drug really works. (Of course, it’s NOT the drug doing the healing!) Page 13 Why you should be ultra-careful in your choice of natural healers. The secret on page 14 reveals why you can experience amazing results from one – and nothing from another. The dangerous “symptom myth” that prevents long-term healing. Avoid it and experience sudden healing miracles with the secrets on page 15. “Want the pink pill or the blue pill?” This controversial experiment on page 15, where patients were offered pink or blue pills, shows how YOU can make your body feel a dramatic shift – good or bad – no matter what you ingest. How to NEVER get duped by drug companies: Ask these four questions about any “drug study” before believing it. Life-saving advice for you and your loved ones. Page 16 A shocking discovery by a Harvard doctor about the real story behind modern medicine. Page 16 The three psychological “pre-conditions” of healing. Once your body receives the “go-ahead” from them, it will correct itself spontaneously and miraculously. Page 17 Medical Research Lies: How 64% of “independent scientists” actually have ties to corporations – and the tricks they use to make their “studies” appear successful. This sneaky way to enhance public perception of a drug was revealed by a leading medical journal, the JAMA. Page 17 Only about 10% of all “conditions” respond very well to mainstream, modern medicine. You’ll see them on page 18. 3 basic attitudes shared by virtually all medical patients – and the only one who typically gets better. Which one are you? Page 19 Chapter 2: The Hidden Laws Behind Sickness and Health The #1 hidden cause behind every disease. When you understand how this “unnatural” phenomenon works, healing becomes so much simpler. Page 22 Why – the longer you let a “crisis” take place in your body – the harder it is to heal. Don’t delay reading page 22. Why “worst” stage of an illness is often the best place to be! Page 23 reveals the thin line between disease and health. Medicine’s #1 Myth: It only seems like a drug, medicine or treatment is healing a patient, when the hidden force on page 23 is the one doing all the work. The danger of ignoring your body’s subtle (and not so subtle) warning signs. It’s how a victim of a sudden heart attack can claim, “But I’ve always been healthy!” Urgent self defense on page 24. Why big diseases often have little causes. Page 24 Trouble with digestion? Surprisingly, you may not have enough acid in your system. 3 easy remedies are on page 24. The little-known, 12-letter culprit behind ulcers – and even many forms of cancer. Page 24 It’s Not Always Your Doctor’s Fault: How the system brainwashes health professionals into becoming “legalized drug pushers” – without them knowing it. This understanding is crucial for knowing the level of care and education you’ll always get in a conventional setting, and how to get finally what you really want: Abundant Health! Page 25 The Great Infection Myth: Why bacteria and viruses are almost NEVER the causes of disease, and how we get duped into this theory. Controversial, life-changing blueprint for self-healing on page 25. Why most people are riddled with infections – and why that’s good news! This little-known “positive half” of the infection process – if you can learn to trust it – is something that even 9 out of 10 natural health practitioners don’t tell you about. Page 25 A reformed MD reveals why, when most people do things to feel better from a sickness, they’re actually getting worse. Page 25 The hidden intelligence in your pain: Once you learn this “real function” of pain, riding out the process becomes easier and the pain itself often naturally fades away. Page 26 Why mainstream pain killers nearly always give you more pain in the long run. Page 26 Nature’s 9 most powerful pain killers. You’d be hard-pressed to find them all in one supplement, especially in the dosages you need. Until you address the deeper causes of pain, they can make your life much easier. Pages 26-27 The secret “hormonal” reason why stimulants, like coffee, can make a strong person weak. Pages 27-28 Do you panic during a “toxicity crisis”? If so, you may be setting the stage for chronic disease. How to stay calm and free your body. Pages 28-29 The little-known, ten word cause behind most stomach problems. And since most disease originates in the digestive system, this condition triggers a host of other illnesses as well! Page 30 The series of little mistakes that lead to a big disease. Page 30 Why virtually everybody has the same kinds bacteria in them, but only some “need” antibiotics. And why, once you understand how this “toxicity bomb” works, you may never have to resort to antibiotics again. Page 31 This rare extract from licorice may be the world’s best short-term solution for an ulcer. Page 31 A young woman once came to me with “irreversible” Crohn’s disease … A so-called “death sentence,” her body was covered in itchy spots that she scratched to bleeding point each night. Life was a nightmare. Yet, only one month later, a checkup with her doctor revealed the disease had totally disappeared. How did she do it? See page 32 How to develop immense self-confidence in your body. It’s easier than you think. Page 33 How trusting your body’s physical healing process can awaken you emotionally, even spiritually. Page 33 Chapter 3: The Four Most Common Causes of Disease – And the Ancient System that Frees You From Each One The Great Calcium Hoax: Discover the real cause of bone density problems. They can be quickly created or cured, depending on what you do with the advice on page 35. More than anything else, the health of this one organ determines your level of wellness. Page 36 If you suffer from any of these 67 symptoms, chances are high you’ve got gallstones in your liver and gallbladder. Page 39 The single most powerful thing you can do to enhance your physical, mental and spiritual health. Page 39 Why most gallstones are not detectable by X-rays. Page 39 20 million Americans suffer from gallbladder disease. Here’s how to avoid it, and the expensive operations doctors recommend. Page 40 How I tripled my energy, eliminated every ounce of pain and stiffness in my body, and dramatically improved my digestion – with one simple process. Page 40 The most comprehensive, step-by-step book on liver cleansing available. Page 41 How you can be putting more liquid into your body, and becoming less hydrated. This is what happens to most people, unwittingly. Page 42 How to tell if you suffer from “thirst disease” – and what to do about it. Page 42 “I never drink water, it makes me sick!” How a 53-year-old Greek woman used a special kind of water to reverse her chronic condition, and began enjoying the healing miracles of hydration again. Page 43 Possibly the single greatest cause of pain in the body. Page 43 Why painkillers not only fail to address the cause of pain, they make it worse. Why there’s no such thing as a safe painkiller. Pages 43-44 This over-the-counter, flavored pain reliever seems harmless-yet even the FDA reports that it plays a role in unintentional deaths each year. Page 44 The single strongest form of stress and how to reverse it. Page 44 Can your brain be dehydrated? Yes! And it’s often the culprit in “brain fog” … chronic fatigue … depression … and countless other ailments. Page 45 If you’ve ever felt like you simply “cannot cope” with a problem, page 45 will tell you why. What’s really happening during a “hangover” … what it means for your body … and how to make sure you never suffer from one again. Page 45 How you can be tricked into thinking that a food or beverage gives you energy, when it really plunders your reserves. Page 46 It would take 32 glasses of water, at a highly alkaline pH level of 9 … just to neutralize the dangerous level of acidity in ONE GLASS of the common beverage on page 46. For every one glass you drink of the bubbly substance on page 47, your body loses three glasses of precious cellular water. (Hint: It’s not soda!) You’ve probably heard about the dangers of chlorine, but did you know the negative effect can be multiplied when combined with specific, otherwise healthy substances? And that most Americans – even the health-conscious ones – are unknowingly making this mistake every day? The solution is on pages 47-48 Ounce for ounce, the best water investment you’ll ever make. Page 48 “Are you crazy? Rice in your water? !” Yes, when you want to cheaply add vitamins and minerals to your water, follow the simple instructions on page 48. The easiest way to “thin” your water, making it easier to pass into your cells. Page 48 reveals a powerful, little-known secret to hydration. How to remove chlorine from your drinking water when you can’t afford a filter. Page 48 This “vitamin C” secret allows you to take a bath without the irritating effects of chlorine on your skin and lungs. Page 48 Body odor … bloating … rapid weight gain … and countless other symptoms-caused by kidney congestion? The startling truth is on page 49. The 36 worst foods for kidney health. Page 50 Why some people have that “puffy” look, no matter how much they diet or exercise. Page 50 The most effective way to avoid mineral deficiencies. It’s NOT about eating mineral-rich food! Page 50 These 8 “body markers” quickly reveal whether you suffer from kidney congestion. Fortunately, drinking this tea for 3-6 weeks can heal them all at once. Page 51 The Myth of the Flu Epidemic: Why the increased incidences of the flu have nothing to do with the viruses “going around” – and everything with our reduced resistance to viral attacks. 14 ways to instantly boost your energy. It’s as simple as avoiding anything you see listed on page 52. The easiest way to avoid heart disease. Page 53 Two steps that can free anyone from the “infection-antibiotics-infection-antibiotics” cycle. Page 53 How the healing process often gets mistaken for a “disease” – and the rare mindset that supports this process to its triumphant conclusion. Page 54 How to acquire the inner satisfaction and emotional stability that makes ending addictions easy. Page 55 Why healing is cyclical, and how to get out of your body’s way – so that it can return to radiant health. Page 55 Why germs only “germinate” in a toxic environment. Page 55 Most infant formulas don’t work, for the reasons on page 56. What never to eat in a hospital. Can you believe these foods are offered after surgery? Page 56 This 7-phase process remedies nearly every health problem ever discovered. Page 58 Avoid these 22 “energy leaks” and your life will be transformed. Page 59 Chapter 4: Where Most Disease Begins — And the Real Secrets to Prevention Chapter 5: 28 Proven Secrets for Returning to Abundant Health Chapter 6: The Simple Secret That Allows You to Maintain Peak Health, Effortlessly Chapter 7: Over 100 Secrets for Igniting Nature’s Healing Power Inside You Chapter 8: Healing Secrets of the Sun — And Why They Boost Your Energy, Strength, and Happiness Chapter 9: The Secret Cause of Heart Disease — And Why It’s So Easily Reversed Chapter 10: Why Cancer Is a Not a Disease — And Why That’s the Good News Chapter 11: 3 Secret Sources of Diabetes — How to Quickly Heal From Them Chapter 12: Banishing the Aids Myth — Secrets for Understanding and Healing From This So Called “Disease” Chapter 13: 8 Dangerous Myths of Modern Living and How to Shrug Off Each One Chapter 14: Over 51 Health Myths Keeping Americans So Sick Chapter 15: What Doctors Don’t Tell You — 37 Health Threats to Avoid Preview of this Book Good health is the most valuable possession you could possibly have. This simple truth applies as much to a newborn baby as to an elderly man, a mother, a doctor, the common person on the street, or the president of a country. Whenever your body becomes sick or does not perform up to what you feel to be normal, you may experience a state of discomfort, fear or depression that can only be remedied by restoring your body’s former health and vitality. To truly feel comfortable within yourself and in your surroundings, you must be able to heal every kind of “dis-ease” that you experience. You are indeed capable of healing yourself. Your state of health is but a reflection of how you perceive yourself and your world. This naturally places the responsibility for your wellbeing where it belongs-in your own hands. Once you have achieved vibrant health, you will not just feel well. You will have become “whole,” perhaps, for the very first time in your life. Timeless Secrets of Health and Rejuvenation can help unleash the tremendous power of healing that lies dormant within you and restore balance on all levels of the body, mind and spirit. Using you own healing powers establishes a permanent comfort zone or continuous sense of satisfaction, which forms the basis for a creative, successful and rewarding life. When you fall ill or your body ages abnormally fast, you may develop an urge to look for a remedy that promises quick relief. Today there is a medical drug or treatment for almost every illness. You are led to believe that if you only suppress or eliminate the symptoms of a disease, such as pain, you have also have eradicated the disease. This ill-founded belief seems to be deeply engraved in our minds. The medical industry plays a major role in re-enforcing it by offering us almost only symptom-oriented treatments. Of course, our own impatience to get well makes us perfect candidates for these fast-acting remedies. But each time we remove a symptom without attending to its cause, we further distance ourselves from regaining the balance required for continuous health and vitality. Consequently, good health remains but a dream, and we may resign ourselves to some degree of ill health, resorting to sayings such as, “Well, that’s life!” or, “We all have to die from something!” Regaining your health is not about applying a magical quick fix; rather, it is a reconstruction process that affects every part of your life, that is, creativity, job, relationships, emotions, happiness, etc. It would be very simplistic to assume that a few vitamin pills, a new wonder drug, an operation, or even an alternative medical treatment could, in the spur of a moment, undo the effects of many years of neglect. The body may have had to endure much strain from not receiving proper nourishment or sufficient sleep and exercise for years on end. Timeless Secrets of Health and Rejuvenation is about setting the preconditions for the body to do what it knows best-creating and maintaining balance-regardless of age and previous health problems. You can find the key to bring balance into every aspect of your life by starting to take responsibility for your own health. This book deals with the most down-to-earth issues of health, such as lifestyle, diet, nutrition, exercise, daily routine, exposure to sunlight, and the like, some of which are derived from Ayurvedic Medicine. Ayurveda, which literally means Science of Life, is the most ancient and complete system of natural health care. Apart from discovering Ayurveda’s time-tested insights into the secrets of healing and longevity, you will also learn how to apply a number of highly effective and profound cleansing procedures that have seemingly miraculous effects on your physical, emotional and spiritual well-being. The simplified scientific knowledge and common sense used in this book generate the motivation for “turning the key” of health and rejuvenation. The book also sheds light on the most common diseases and misunderstood medical practices today, of which everyone should be aware. Concerning the improvement of personal health and well-being, we are being challenged to make a major shift in both our individual and collective attitudes regarding health and freedom. We must move away from the pre-programmed expectations of illness and aging toward the anticipation of continual youthfulness and vitality. The old saying that everyone has to age and die seems to be a repeatedly verified belief doctrine that most people in the world follow blindly without questioning its validity. Could it be possible, instead, that illness and old age occur because we believe they are an inevitable curse to which we all are subjected and with which we are doomed to live? If so, in order to fulfill the curse or belief, as happens with most self-fulfilling prophecies, we are setting the stage for its execution. Although quite unaware of this human drama, we actually allow ourselves to adopt various methods of self-destruction, through derogatory diets, lifestyle and behavior. Right from the early years of childhood, our parents, teachers and society have sentenced us to the “fact” that the body has no choice but to deteriorate and eventually to die from old age or an illness. It used to be that you would only see a doctor if you felt ill. Today, you must have a doctor regularly check on you before you are born and then for the rest of your life. The generally accepted belief that humans are fragile beings that need medical assistance from time to time, especially as they grow older, generates a distinct feeling of being out of control, of being dragged down the dark corridor of time by a mysterious power called aging. The feeling of not being in charge or control is one of the most common causes of physical and mental illness; most people call it “stress.” The idea of being vulnerable and unsafe generates fear, which in turn triggers profound biochemical changes in the body. These changes become the physical “reality” of ill health and aging. Through the intimate mind/body connection, every thought and feeling, to a greater or lesser degree, alters your experience of health and well-being. A bout of depression can paralyze your immune system, and falling in love can boost it. If you are convinced that aging is natural and cannot be avoided, this will be the reality you will create for yourself. Likewise, you can draw on the same force that causes destruction in the body and direct it toward healing and rejuvenation. You can prove to yourself that growing old and becoming more prone to illness are merely the manifested projections of ignorance about the real nature of life. Disease and aging are not part of your body’s genetic design. Even the so-called “death-gene,” which is in charge of terminating the lives of cells in our body according to their various predetermined life spans, is the one that keeps us alive. Without this gene we would all die from cancer within weeks. In this sense, controlled destruction is the giver of life, and life growing out of control. as is the case with cancer cells, can be the harbinger of death. New gene research suggests that we could grow as old we want to. There is nothing in the normal, original setup of our body that indicates it is causing its own aging or diseases. However, abundant evidence exists to show that aging and illness originate in the combined effects of fearful, negative mental attitudes, emotions, and excessive accumulation of toxic waste materials in the body. As a human race, we are about to recognize the vanity of participating in the hypnosis of social conditioning that keeps our mind veiled in the shadows cast by misinformation. Many of us have already begun to let go of the fears and doubts t hat keep us from realizing the tremendous powers that are patiently waiting for us to put them into action. To make a real difference in life, we need to employ our vast potential of energy, creativity and intelligence for the truly essential issues in life and for generating a profound sense of happiness. One of the keys to unleash our endless potential is the body itself. The body is constantly engaged in turning over its cells, which in itself is a miraculous and extremely complex process, unmatched by anything man has ever created (please note that whenever I use the terms “man” or “mankind,” I am referring to both genders). The numerous types of proteins that make up your genes and constitute the cells in your body are replaced every 2-10 days. Radioisotope studies show that 98 percent of the atoms that compose your body today won’t be there in a year’s time. This renewal process affects all parts of the body, including the blood, muscles, organs, fat, bones, nerves, and as recently confirmed, brain matter. With the continual replacement of all the cells, you should be able to have a new body and, consequently, a new lease on life, at least once every few years. In this book you will learn about the body’s built-in mechanisms that can stop the clock of aging and make you younger and healthier the more years you add to your chronological age. We are right in the middle of a tremendous global transformation that has already greatly influenced, if not shaken up, the very foundation of conventional medicine. The old division of body and mind into completely separate and independent entities is crumbling fast with the knowledge supplied by the more progressive wings of medical science such as Psycho-Neuro-Immunology or Mind/Body Medicine. The division of body and mind, which is based on the old and outdated paradigms of understanding human nature, has never really existed. Nevertheless, this false notion about the true reality of human existence continues to make man believe he is essentially a physical being. And to some degree, we all agree with that idea. Since today’s study and practice of human health largely ignores the important role of the mind, feelings and emotions, those put in charge of taking care of our well-being stand little chance of guaranteeing us a reasonably satisfying state of health. As it will become apparent from reading this book, instead of eradicating disease from the surface of the earth, the purely symptom-oriented approach to health care has greatly diminished the probability of truly curing diseases and, in fact, has contributed to the occurrence of chronic diseases and death more than any other cause. We are now beginning to recognize the inseparability of the body and mind. The breakthrough discoveries in the field of mind/body medicine have already helped thousands of people regain their health. Current scientific understanding shows that mind and body never exist as separate or independent entities. A hand can never write a letter unless the mind orders the hand to do so. You cannot even move your eyes to read these words unless your mind has given you the definite instruction to follow their sequence. The mind also must have the proper perception of the body and the will to maintain life. Consider, for example, a person with anorexia. Because the person’s thoughts are distorted to believe that she is fat, the desire to eat is greatly diminished or stopped, causing the physical body to deteriorate or even die. Thus, the mind and body are intimately connected and dependent on one another. Our life is controlled by what I call “super intelligent body/mind.” Without its supervising presence, the body’s 60-100 trillion cells, with their over one trillion biochemical reactions per second each, would proportionally generate as much chaos and confusion as would be created in the case of the dissolution of the universe. You can also experience the intimate relationship between mind and body when you get a stomachache from feeling upset, or when you faint after receiving a very distressing piece of information. Some people have literally turned gray overnight due to a traumatic event, and others blush when they feel embarrassed. Heart attacks can be triggered by a single bout of anger or intense anxiety, regardless of whether the coronary arteries are clogged or open. All thoughts and feelings are instantly translated into biochemical compounds within the brain and within every other part of the body, thereby altering physical appearance and performance. In fact, every bit of mental activity leaves us with a specific physical sensation, known as emotion. Emotions are composites of both mental impulses and physical changes, and they express the totality of one’s health at any given time. Your endocrine system, which produces hormones in response to your mental experiences, is indeed your personal drug store, and it comes free. Your inner pharmacy can make any drug you need, and you are the pharmacist who writes the appropriate prescriptions. Depending on your emotional response or reaction to a particular event or challenge, the drugs and their doses vary accordingly. They may include the stress hormones adrenaline, cortisol and cholesterol. When released into your bloodstream in response to anger, fear or rejection, for example, these hormones can save your life, but if secreted in an ongoing manner, they may damage the blood vessels and impair the immune system. Your happy emotions, on the other hand, manifest as endorphins, serotonin, interleukin II or other drugs that are related to the experiences of pleasure and satisfaction. If you produce enough of these chemicals, you may even be able to arrest the aging process. Carefully controlled studies have shown that you can reduce your biological age by 10-15 years within ten days, provided your interpretation of your life experience undergoes rapid and positive changes. By contrast, you can also put on 20 extra years within a single day if you enter a state of hopelessness and depression. Hormones produce extremely powerful effects, both in a positive and negative sense. Yet even more powerful than hormones are the thoughts and intentions that trigger them. For many years now, hospitals have been recording cases where cancer patients have experienced what is generally known as “spontaneous remission.” A remission of a cancerous tumor or other serious illnesses may occur when the affected person suddenly enters a feeling of profound trust and unprecedented happiness. Others recovered from a terminal illness when they got “addicted” to laughter. Our physical makeup is capable of providing formerly unknown and extremely powerful chemicals in response to a newly adopted perception of reality. This intrinsic ability of the human mind/body system can help evolve our hormonal system (endocrine system) to a much higher level of efficiency and bestow abilities to our body that are beyond our current level of understanding or imagination. The mind/body connection will be discussed at great length at the beginning of this book because it forms an essential part of the endeavor to improve our physical and mental health. The journey to develop a permanent state of health and vitality has very little to do with treating disease. Yet treating illness is the main focus of conventional medicine. True healing is about reestablishing the intimate connection that exists between a healthy body and mind. It would be foolish to try combating darkness in a room when all we need to do is to switch on the light. The darkness isn’t the problem we need to get rid of. It is the missing light that creates the darkness. By lighting a candle in a dark room, the darkness disappears instantly. Likewise, disease disappears by the act of generating healthy, life-supporting effects in our body and mind. The bottom line is that good health remains an unrealistic dream when the focus is on disease. Blaming an illness for our lack of well-being, and treating it as if it were an enemy, forms the very basis of today’s health crisis. A basic natural law states that energy follows thought. If disease is your point of attention, or remains a point of reference and truth in your life, you are going to be stuck with it because disease thrives on negative energy. Over 90 percent of all diseases in our Western civilization are chronic by nature; for these there are no successful treatments available, at least not in the field of conventional medicine. The inadequacy of the modern medical system to deal successfully with chronic disease is rooted in the collective conviction that we need to get rid of the symptoms of disease in order to get our health back. If we instead focused our attention on setting the preconditions and restoring the mechanisms responsible for creating and maintaining good health, health would return quite naturally. It is not disease that needs attention; it is the patient who requires love, care, nourishment and the feeling of being complete again. The single most important experience that the unbalanced body/mind needs for healing is the experience of happiness, which results when a person begins to take his health in his hands and removes whatever congestion and imbalance may exist in the body. This is a highly self-empowering process, which is pleasing to the heart, body and soul. A fascinating study showed that happy people are the least likely to catch colds, regardless how often you expose them to a cold virus. Also, people who are in love show a higher resistance to disease. To create a positive state of health can be a powerful happiness-generating event. Happiness returns spontaneously in a person who, suffering from a cold or a disease, starts to feel better again. Happiness and health are attractive to us; disease is not. Unhappy people can never be truly healthy, just as unhealthy people can rarely be truly happy. A person who suffers from cancer and learns to apply the methods of regaining his happiness described in this book may suddenly cure himself, but if he continues hating his mother, father or ex-spouse, then even these or similar therapies are bound to be unsuccessful in the long run. By focusing on disease or negativity in life, one remains trapped in unresolved and continuous cycles of anger and conflicts. This, in turn, will have a powerful immune-suppressive effect and prevent true healing from taking place. The focus on the destructive characteristics of a disease – widely known as symptoms of disease – cannot serve as a source of inspiration to bring about a real healing response and an ever-evolving state of health. There is, in fact, little to be gained from a fascination with disease, including its diagnosis. In contrast, there is everything to be gained from a fascination with health. The human body has no built-in programs for sickness, but it has many programs to maintain a state of perfect equilibrium or balance, and if balance is lost, to return to it. It is the nature of the human being to be healthy, but it is up to us to set the preconditions for these programs to work efficiently. To repeat, healing is absent when happiness is absent. Bereaved persons, whose sense of joy has virtually become non-existent, demonstrate this most clearly. Widows rank among the highest in the risk groups for cancer. Sadness, because of the loss of a loved one, blocks a person’s normal immune response to fight cancer cells, even though his or her T-cell count may be in the normal range. Major studies on heart disease have shown that lack of happiness and job satisfaction head the list of risk factors for heart attacks; they are far more endangering to our health than animal fats, alcohol and even cigarette smoking. The main purpose of life is to increase happiness. Any action that deviates from our purpose and does not support this most basic principle of life is destined to fail or generate impediments – problems that are designed to lead us back to the path of happiness. This is as true for the field of health as it is for every other area in life. Most of the advice given in this book has an uplifting or a clarifying effect, thus providing a solid foundation for creating and maintaining good health. The liver and gallbladder flush described in chapter seven, which can remove hundreds of gallstones from these important organs within a few hours, can by itself trigger waves of utter wellness and eliminate deep-seated anger and frustration. The clearing of severely blocked ducts and channels of circulation in the body can have truly blissful effects and most certainly change one’s priorities in life. With the continued improvement of your health, you may find yourself entering a state of completeness where the pieces of the puzzle of life will naturally fit into their designated places. As you read about the various ways of improving your physical health, try to remember that they are closely tied to your mental and emotional well-being. If you suffer from a particular illness like cancer, heart disease or AIDS, apart from dealing with the physical aspect of the imbalance, you will also need to attend to its mental and emotional counterparts. Disease is not something that you just “catch.” Instead, it is something you create by repeatedly setting up the same limitations that prevent your body and mind from being in their naturally balanced states. You don’t need to receive permission from anyone or from any government agency to improve your health because this is your natural birthright. The advice given in this book is not meant for curing diseases because it is not disease that needs curing; it is the suffering person who needs to become whole, happy and vital again. You can never really cure a disease because disease only occurs when health is no longer being created or when you are no longer in tune with your inner purpose, your natural sense of joyful existence, and the world around you. However, once you have allowed balance to return to your body and mind, disease will disappear by itself, just as the darkness of the night disappears with the light of the day. Most of the data and research that I mention in this book is based on what are generally considered “reliable” sources, such as published papers and scientific journals. But although I have cited scientific research studies throughout the book to clarify and illuminate basic insights, it is my opinion that medical research in itself cannot serve as a reliable source of truth and reality. In fact, most medical research has been used to serve vested interest groups, such as the pharmaceutical industry, to manipulate the masses into submission and expose them to potentially fatal treatments. All research is unaltered by the changing factors of time, the unaccountable subjectivity of the researchers and those being researched, as well as the intended objectives of the research. In my view, scientific research should not be used in an exclusive manner to formulate a particular truth because it is very easy to employ research studies as a means of manipulating opinions and beliefs. In the United States, the FDA withdraws about 150 pharmaceutical drugs from the market each year because of the harmful, dangerous side effects they generate in numerous consumers. These are the same drugs that the FDA had approved several years earlier, on the basis of the rigorous “scientific” testing procedures that are employed in all clinical studies today. Take the example of the arthritis drug VIOXX, or other painkillers, including CLELEBREX, ALEVE, and BEXTRA. Isn’t it astounding that these poisonous, expensive drugs could have passed all the supposedly rigorous, scientific safety tests and been sold to millions of unsuspecting arthritis sufferers, just to find out years later that they sharply increase the risk of heart attack and stroke? Could there be double standards for “rigorous testing” in the field of medical research, one for before and one for after introducing these drugs to the market? How many thousands of people needed to die (death dramatically raises the stakes for expensive law suits) before the drug producer Merck “volunteered” to withdraw the drug from the market? Likewise, how can powerful antidepressants be given to unhappy children, when it has been demonstrated that these drugs increase the risk of suicide? These are questions that reflect physic’s “uncertainty which turns the use of medical drugs into a gamble with one’s life. The stamp of scientific approval is perhaps one of the most dangerous tools employed by the medical industry today. I am often asked to supply the exact references for those studies I sometimes refer to, but doing so would place too much credence and reliance on something that is so heavily flawed and unreliable. I suggest that you take any statement or argument you are not sure about into your heart and ask your body how it feels. (A body-testing procedure is described in chapter one.) Most likely, you will receive a definite answer from your body, which will signal either weakness or strength, or any other form of discomfort or comfort, depending on the input. This book is about enhancing your intuitive and cognitive abilities, rather than presenting mere book knowledge to satisfy intellectual needs. The secrets of health and rejuvenation constitute not a foreign body of knowledge we need to introduce from outside. You are the source of these secrets, and the timeless healing wisdom contained in this book is here to show you how to discover and apply them for your own benefit as well as that of mankind.